What does Cosmetic Skin Solutions Resurfacing Serum do? This glycolic acid serum gently exfoliates your skin, revealing new and fresher looking skin and giving you a brighter and more glowing complexion. Old dead cells are removed, pores unblocked and fine lines and wrinkles minimized. Cellular renewal is accelerated and your skin is re-textured to look smoother and more radiant. Who should use Cosmetic Skin Solutions Resurfacing Serum? Anyone whose skin looks dull and tired will benefit from this glycolic acid serum. Also those of you who suffer from blackheads, blocked pores or acne will appreciate the exfoliating effects of this serum. It is suitable for all skin types. 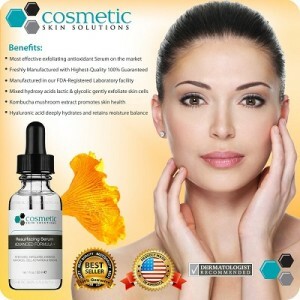 How do you use the Cosmetic Skin Solutions Serum? Once you have cleansed your skin in the evening, massage 5 or 6 drops of this glycolic acid serum into your face and neck. When fully absorbed into your skin, follow up with a moisturizer. Remember to use a sunscreen when using glycolic acid products. This glycolic acid serum does not contain parabens or oils, is cruelty free and is made in the USA under strict FDA guidelines. It contains a mix of glycolic acid and lactic acid, as well as Kombucha extract and hyaluronic acid. Glycolic acid is an alpha hydroxy acid that penetrates the top layers of your skin, exfoliating all the dead cells and initiating cellular renewal. Due to its exfoliating properties, glycolic acid products also help to remove deeply embedded blackheads and to clean out severely blocked pores. This means that it is great for helping to reduce acne, which is caused by a build-up of dead skin cells and blocked pores. As a result, your skin looks much brighter, fresher and younger. This serum contains both glycolic and lactic acids, both of which work in the same work to exfoliate your skin. Glycolic acid tends to penetrate deeper than lactic acid though, because its molecules are smaller. Kombucha tea (made from mushrooms) contains lots of organic acids, active enzymes and amino acids which is said to boost your body’s immune system and help to fight the signs of aging. Other studies claim that Kombucha helps to hydrate your skin and improve your skin tone, as well as reduce fine line and wrinkles and to brighten and freshen your skin. It is usually drunk as a tea, but is now being included in skin care products to help our skin retain its moisture and elasticity. Known as a super hydrator and the fountain of youth, hyaluronic acid can hold more than 1000 times its own weight in water. It delivers a pulse of hydration deep into your skin’s tissues and helps to rehydrate tired, dull, dry skin. This is a fabulous ingredient in a serum if you suffer from dry, aging or rough textured skin, which tends to sag due to a loss of collagen. With the daily use of a serum containing hyaluronic acid, your skin will become softer, smoother and more youthful looking. PROS: More than 80% of all customer reviews gave this glycolic acid serum a 4 or 5 star rating. Customers feel that their skin is much brighter and smoother, with less fine lines and wrinkles. A number of people said that the results are not instant, taking a few weeks or months, but that you do see real benefits from using this glycolic acid serum. Customers with sensitive skin have also stated that they have had no problems using this serum. CONS: Only a few of the customer reviewers gave this serum a one star rating because it didn’t make any difference to their skin. This is an essential, everyday product for me. Works really well! Great affordable serum comparable to much more expensive brand. WOW. I love this stuff. It does just I need it to do. My skin looks healthy and even tone. After the first 3-5 days I could tell a noticeable difference in the texture and brightness of my skin. 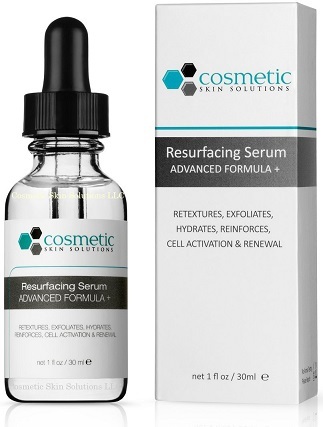 Does the Cosmetic Skin Solutions Resurfacing Serum really work? This is a great exfoliating serum, which is loved by Cosmetic Skin Solutions customers (and it is very affordable as well). If you read the reviews you will see that many customers have been using this glycolic acid product for years and simply keep reordering it because it is so good.